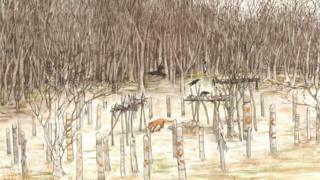 Image caption Jan Dunbar's artist impression of the Neolithic "mortuary"
The Neolithic enclosure in what is now Aden Country Park may have been used for excarnation, the removal of flesh leaving only bones for burial. This sometimes involved leaving bodies outdoors for scavenging animals. Remains of an enclosure marked by wooden posts and living trees were first found in a dig in November 2018. Archaeologists said this "exciting, extremely rare discovery" had resulted in the need to carry out a further excavation. They hope to uncover more of the history of the site and confirm the layout of the possible Neolithic structure. The Friends of Aden has started a crowdfunding campaign to help raise £1,000 towards the cost of the new dig and associated activities between 24 June and 7 July. Volunteers from the local schools, groups and wider community could be involved in the excavation. Archaeologist Ali Cameron, who has been commissioned by Aberdeenshire Council to lead on archaeology aspects of the project, said last year's dig revealed a larger structure than had been anticipated. She said: "It is an intriguing enclosure with both posts and living trees and must have been very prominent in the landscape. "We are really looking forward to going back to the site in June and finding out more about this site." Derek Jennings, of the Friends of Aden, said the group had been "astounded" at the considerable amount of archaeology that was being uncovered at the park. The dig in November was through the Aden Country Park Restoration and Redevelopment Heritage Lottery Fund and the Aden Archaeology Historic Environment Scotland project.